Amazing WATERFRONT Opportunity at Idabel Lake Resort!! "The Summit Suite" is a rustic 3 bedroom condo that sleeps 10!! 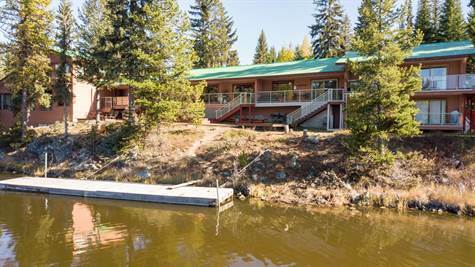 This fully furnished unit features a deck overlooking the lake with a PRIVATE HOT TUB as well as access to the lakeside lower patio. The Resort has things to do in every season - swimming, kayaking, quadding, fishing, relaxing on the dock, snowmobiling, nordic skiing, ice skating, playing in the park or games room or just exploring the great outdoors!! There is no shortage of activities for your family to enjoy!! There is an onsite caretaker as well as a rental management company. Use it yourself and also take advantage of the revenue potential - this unit has averaged almost $30,000 IN RENTAL INCOME over the past few years!! Escape the City to enjoy peace a quiet - only 35 mins from Kelowna.